Reading An Indomitable Beast helped jump-start my fascination with jaguars. I was already interested in them, but Dr. Rabinowitz’s book turned my curiosity into passion. A powerful blend of science and personal disclosure, An Indomitable Beast is an excellent introduction to this species. Dr. Rabinowitz provides an overview of jaguar ecology, cultural impact, conservation, and of his personal connection to this amazing animal. This is a must read for anyone even the slightest bit interested in big cats. Biology and Conservation of Wild Felids is perhaps the most comprehensive anthology on wild cats to date. Edited by Professor David White Macdonald and Dr. Andrew J. Loveridge, it contains a wealth of information on these fantastic creatures: from felid evolution to the interdisciplinary nature of their conservation. I recommend Predatory Bureaucracy to anyone who’s interested in conservation in the United States. Using wolves as his flagship species, Michael Robinson describes the history of this country’s conservation movement in great detail. He describes not only the unusual vigor with which wolves and other predators were eradicated, but also the evolution of attitudes towards wildlife. Predatory Bureaucracy helps to put current issues in the United States into a valuable historic perspective. Like An Indomitable Beast, The Jaguar’s Shadow by Richard Mahler helped fuel my passion for jaguars. It’s a remarkable book that describes Mahler’s attempts to see a jaguar in the wild. The Jaguar’s Shadow contains a wealth of information about these cats, giving readers an excellent understanding of the current state of jaguar conservation. To top it all off, The Jaguar’s Shadow is superbly well-written. Eyes of Fire: Encounter with a Borderlands Jaguar is Warner Glenn’s extraordinary account of his 1996 sighting of a wild jaguar in Arizona. This event was the turning point in jaguar conservation in the United States, and Warner Glenn has been a champion of the species ever since. Eyes of Fire is replete with ten stunning photographs Glenn took during his encounter. Natural Enemies: People-Wildlife Conflicts in Anthropological Perspective offers a fresh take on human-wildlife conflicts. Edited by Dr. John Knight, it features a collection of case studies written by social anthropologists. By focusing specifically on the human dimensions of conservation conflicts, these researchers uncovered details that are often overlooked. They provide evidence that the drivers for such conflicts often extend beyond economics, and that peoples’ relationships with wild animals can be complex. This makes Natural Enemies a valuable tool for conservationists. Knowledge is meaningless unless it is put to use. The Public Interest Research Centre (PIRC) understands this as well as anybody. Not only have they spent many years uncovering the psycho-social drivers of human behavior, but they have used their research to develop sensible advice for conservationists. 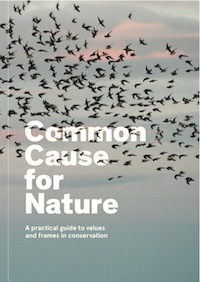 This makes Common Cause for Nature: A Practical Guide to Values and Frames in Conservation an invaluable tool. It is brimming with easy-to-understand information about how to communicate in ways that will motivate people to care about nature. Therefore I recommend this book to anyone who is concerned about the state of the planet. Common Cause for Nature provides an excellent sense of how one should, and should not, talk about the natural world.